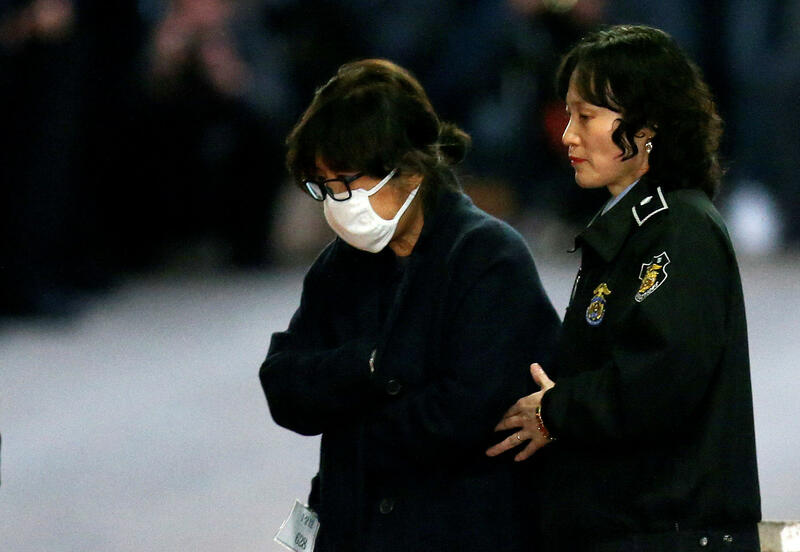 SEOUL, South Korea -- A longtime friend of South Korean President Park Geun-hye was arrested and jailed Thursday over allegations of influence-peddling and other activities that have touched off a political scandal that has threatened Park’s leadership. The arrest of Choi Soon-sil came as many opposition lawmakers demanded that prosecutors investigate Park over the scandal. With one recent opinion survey showing Park’s approval rating plunging to about 9 percent, her prime minister-nominee also said investigators could look into Park. Seoul Central District Court on Thursday accepted a prosecutors’ request to issue a warrant to arrest Choi, according to court spokesman Shin Jae-hwan. Choi is to be held in a detention center pending a court verdict, Shin said. South Korean media speculate that Choi, who is not officially in the government, manipulated government affairs and pushed businesses to donate millions of dollars to two foundations that she controlled. Last week, Park offered a public apology after acknowledging Choi had edited some of her speeches and provided public relations help, but South Korean media speculate that Choi played a much larger, secret role in government affairs. Choi has previously said she received some of Park’s speeches in advance but that she didn’t know if she was seeing confidential information. Choi is the first person arrested in connection with the scandal. On Wednesday night, prosecutors detained one of Park’s former senior presidential secretaries after summoning him for alleged involvement in extracting $70 million in donations. Prosecutors have 48 hours to determine whether to request an arrest warrant for Ahn Jong-beom or release him. Much of the public frenzy over the scandal is associated with Choi’s family background. Her father led a religious cult and reportedly was a private mentor for Park, whose parents each were assassinated in the 1970s. Park’s father was a military dictator who ruled South Korea for 18 years. While acknowledging her ties to Choi Soon-sil last week, Park said Choi helped her “when I had difficulties” in the past. Park has already been criticized for an aloof manner and for relying on only a few longtime confidantes. That she may have outsourced sensitive decisions to someone outside of government, and someone connected with a murky, lurid backstory, has incensed many. Park, who hasn’t made any public comments on the scandal since her apology last week, fired eight presidential secretaries and nominated three new top Cabinet officials including the prime minister in an effort to regain public confidence. Opposition parties have described Park’s personnel reshuffles as a tactic to divert attention from the scandal. Park may survive what has become the worse patch of an already rocky four years in office. But if her choice for prime minister, the country’s No. 2 job, is rejected and she is forced to name someone chosen by the opposition, it will hamstring her authority and may end her ability to govern. On Thursday, Park’s choice for prime minister, Kim Byong-joon, told a news conference that he thinks it’s possible to have Park investigated, though he said the procedures and methods of any probe of the head of state must be carefully handled. Kim said there are different interpretations of a constitutional provision that grants sitting presidents immunity from criminal lawsuits unless they are accused of serious crimes such as treason. He didn’t elaborate, but his comments likely reflected a view by some scholars that the constitution disallows an indictment and other legal steps beyond an investigation or questioning of the president.